In my last article I described how I wanted to help introduce FusionReactor to ColdFusion developers with a special focus on helping solve practical problems and navigating terminology that may not be terribly familiar with if you haven’t used Java before. 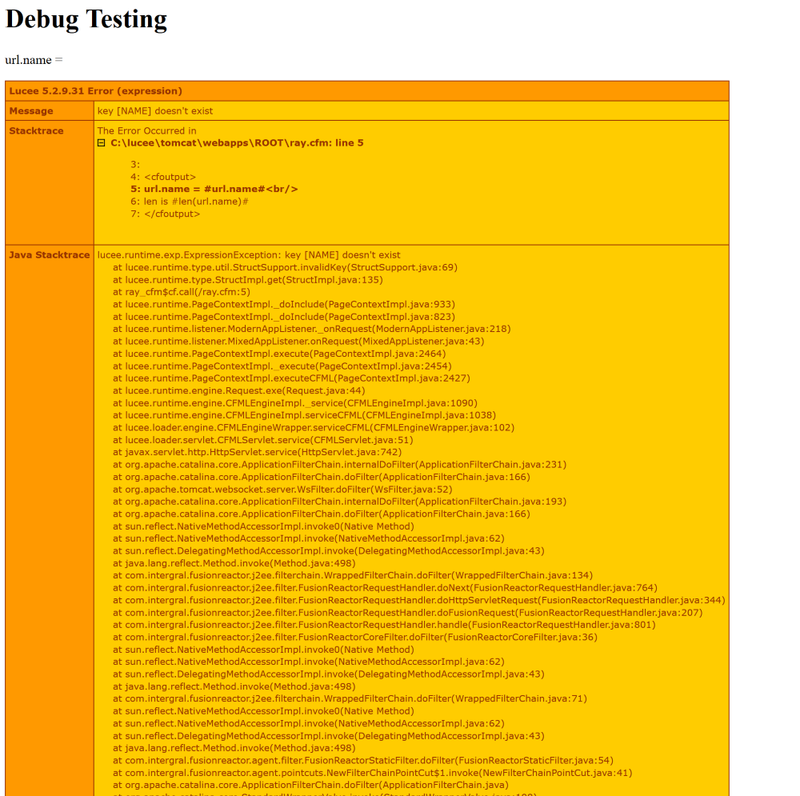 In that first article I focused on using the FusionReactor portal to find and diagnose pages that were throwing errors. In this follow up I’m going to highlight another great use of FusionReactor – finding slow pages. Slow pages can be difficult to find. A page that runs fast on your local server could run much slower in production. A page with a complex set of inputs, like an advanced search field with numerous filters, can only run slow when a particular unique set of choices are made. Sometimes your code can be absolutely perfect, but an external factor is the culprit. Perhaps you’re integrating with a database that you have no control over, or maybe you’re using a third party API that has performance issues of its own. In this article I’m going to highlight multiple examples of slow pages and how FusionReactor can help you find, and hopefully fix, each of them! Ready? You’ll notice the display is split between currently running slow requests and requests that have already finished but were considered slow. Which begs the question – what’s “slow”? 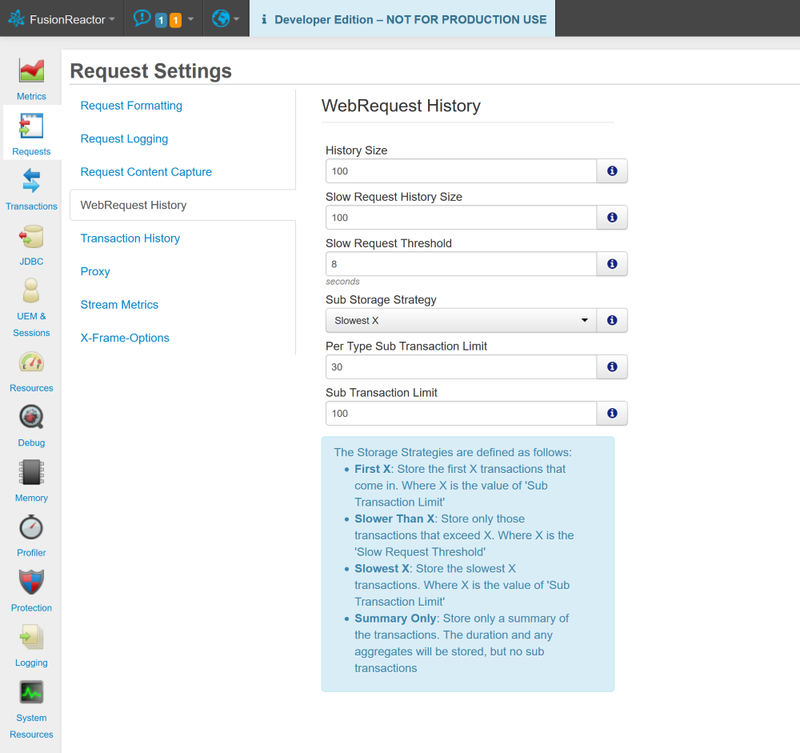 Under Requests, go to Settings, and then select WebRequest History. Here you will find multiple settings you can configure including what the threshold is for something being considered slow. In my FusionReactor 8 instance this was set to 8 seconds. And just to be re-iterate, this is important even if your ColdFusion page isn’t returning markup. If you are using ColdFusion to power a client-side application with JSON data, then you still need to ensure you’re returning a speedy response. So yes, this is very, very important stuff. I’d go ahead and change that number from 8 down to 1 or 2. See what works best for you. 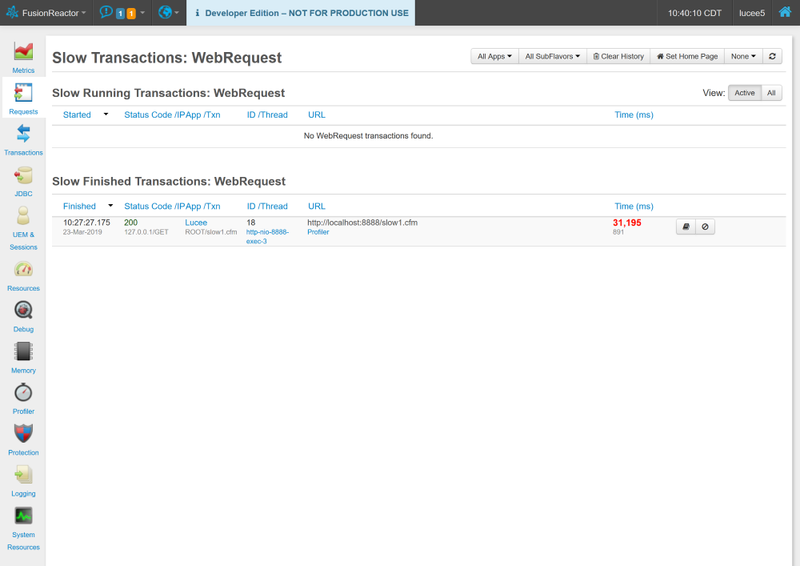 This is a sorted view of requests with the slowest being displayed first. This is not filtered by the Slow Request threshold but covers everything. Also note it includes non-ColdFusion files as well! It simply uses the sleep function to pause the execution for 30 seconds. If you’ve never seen cfflush before, it tells the ColdFusion server to send out existing output to the browser. As a user, you would see the initial HTML, the browser continue to load, and then the rest of the results. This will definitely cause a slow request to be logged. Unfortunately, unlike the error conditions we saw in the previous article, it’s a bit more difficult to diagnose. Let’s see why. First, here’s the details page for this particular request. There’s a few things to note here. First, the slow time is nice, bold, and red. You can’t miss that and that’s a good thing. Now make note of JDBC. Don’t know what that means? 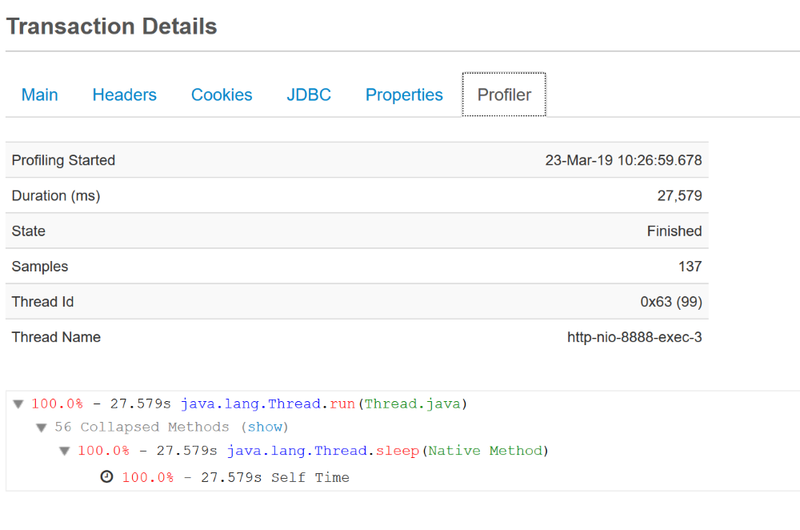 JDBC is the acronym for Java Database Connectivity. Basically this is how ColdFusion speaks to databases. I started ColdFusion development way back in 96 or so, before ColdFusion ran on Java, but even back then the biggest culprit for slow requests was issues at the database layer. We aren’t doing any database requests on this page but nine times out of ten you want to turn your focus here. Every single one of those metrics is crucial and can be a flag for an underlying issue. As a real example of this, I was working with a client and discovered they had about 1000+ database queries being run in a request. How did this happen? They had queries in an Application.cfm file, queries in a header file, queries in a file loaded by a header file, and so on and so on. 90% of these queries were the exact same query run multiple times. They weren’t stupid – they just didn’t realize everything going on in one particular request. This can happen as a web application grows larger and more complex, and is yet another reason to consider a tool like FusionReactor! So in this case, you can’t really get to a particular line of your template or ColdFusion method. But even if you’ve never used Java before, seeing 100% correlated to java.lang.Thread.sleep should give you a clue as to which particular tag was the issue. In this case, the serverless function I’m hitting is using setTimeout to delay the response for 3001 milliseconds. This page is going to be slow, but it’s something out of ColdFusion’s hands. (But to be clear, this is still something you could address. Can you cache the result? Can you fire it via a scheduled task and store the result locally? You’ve got options!) So how is this reported in the profile? In this example, you can see two things that stand out – first Http.java and then Dump.cfc. The later clearly refers to the cfdump tag which typically wouldn’t be run in production. But Http.java should definitely be enough of a clue to tell you where the issue is. Of course, you may run into an issue if you have multiple HTTP calls in your ColdFusion page. In that case you’ll need to do further testing to see if you can determine the culprit. The important thing to note though is how FusionReactor got you nearly 100% of the way there! In this article I simply introduced the Slow Request views in FusionReactor and used it to find a few problem scripts that should be fixed. In my next article I’m going to turn my attention to database specific issues and show you how FusionReactor helps there. As always, leave me a comment below if you have any questions! As a ColdFusion developer, you may know that it’s running as a J2EE server but also may have zero to no idea what that means in a practical sense. ColdFusion has always been easy to use, especially for developers from a non-traditional background, and this sometimes means there’s aspects of the platform that aren’t quite as easy to understand as others. A great example of this are the things that are more Java-centric. 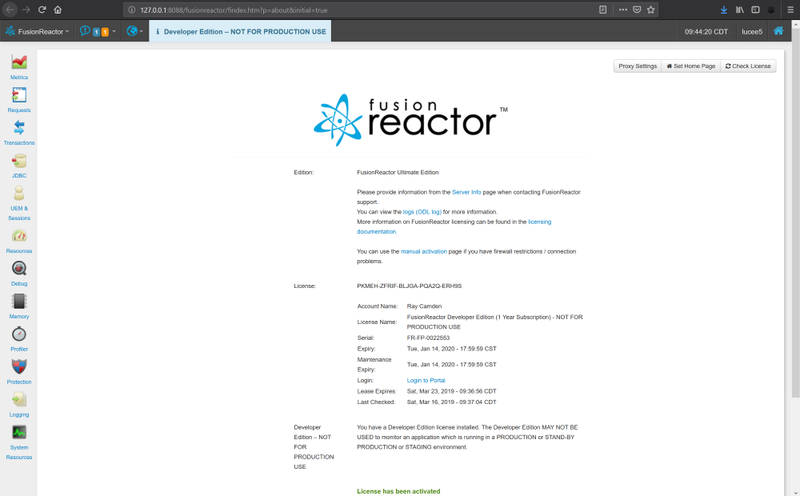 FusionReactor integrates with your ColdFusion server from a Java-perspective, which means it maybe uses terms that may be unfamiliar to the developer who only knows CFML. And yes, you can, and should, consider learning more about Java, but at the same time, we don’t always have the opportunity to pick up a new language! You may need to get things working now and what I’d like to do in this article is help you, the CFML developer, better understand how Fusion Reactor reports issues and get you to a point where you can quickly identify (and fix!) your problems. My assumption is that you’ve already installed FusionReactor. If not, head over to the downloads and grab a copy. You can get your trial key there and use it to test and evaluate the product. As I’m writing this for CFML developers who aren’t familiar with Java, I strongly urge you to use the “Automated Installers”. I’m testing on a Windows machine with Lucee but obviously you can use Adobe’s ColdFusion product as well. I’m also assuming you’ve set up a FusionReactor instance pointing to your ColdFusion server so you can start monitoring and debugging. Once you have, you can open that instance. There’s a heck of lot to FusionReactor but in this article I’m going to focus on just one particular aspect – errors. Luckily, I’m a born error creator. One of the best. I should probably get endorsed on LinkedIn for writing buggy code. Thankfully that’s made me something of an expert in debugging a file and figuring out what went wrong. That’s rather easy while I’m writing and testing code. It isn’t necessarily helpful when the code is in production and being used by the public. Let’s consider a simple template that seems to be bug free. Ok, astute readers will recognize the issue with this code. What happens when you don’t pass the `name` value in the query string? In this case it’s probably obvious what you did wrong. This is easy enough to fix by either setting a default or adding logic to redirect when the value isn’t defined, but what if you miss this and deploy the code to production? Assuming you’ve done that and got a report from your users (or even better, your manager at 2AM on Saturday), let’s quickly see how FusionReactor can help you find this issue. Alright, so you’ve got a report about something going wrong. In a perfect world, that report includes the URL, query string, what the user was doing, the phase of the moon, and more. Also know that ColdFusion has excellent built-in error handling that can send you detailed reports… if you added that to your project. * Status Code: When a request is made over the web, a server returns a code that represents how it was handled. `200` represents a good response. `500` is a bad response. (And note how FusionReactor is flagging that already!) There’s a great many different status codes out there and you should take a look at them sometime. * URL: This tells you the URL of the request and normally, but not always, will give you an idea of the file that was requested. Many people will use URL Rewriting to “hide” the fact that ColdFusion is running. In this case it’s pretty obvious: `http://127.0.0.1:8888/ray.cfm`. 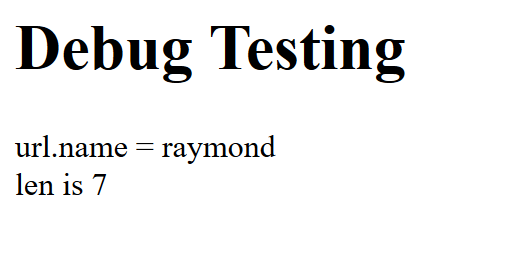 Given that the URL path is `/ray.cfm` I can figure out that it’s the `ray.cfm` in my web root. But you can’t always count on it being that easy. 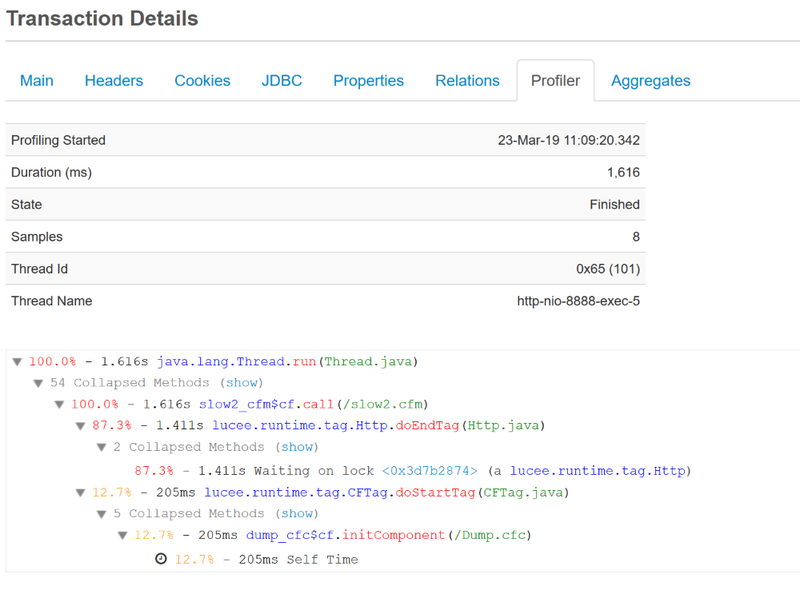 Also note that the error in this view is Java-related: `lucee.runtime.exp.ExpressionException`. Don’t worry – we’re going to dig into this. This is showing the same information, just filtered to requests with errors. Alright, so you’ve found a request with an error, how do we diagnose it? On the right hand side is a “book” icon which will load details. Let’s do that and see what we get. The first two blocks give you a good idea of what’s going on. `key [NAME] doesn’t exist` is a clue that your code tried to use a variable that didn’t exist. If the `key` aspect doesn’t make sense, it may be helpful to remember that ColdFusion variables are scopes, or structs, and when you access `url.something`, you’re trying to use a particular key in that scope. Alright, so we’re closer. Now our particular ColdFusion file is very short but imagine a much larger template, how would we find where the error was thrown? In theory, you’re done, but FusionReactor can help you a bit more. In the left hand navigation, look for the Debug menu and select Sources. In the screenshot above I’ve simply specified my Lucee root. When you’ve done that go back to the Requests view, find that broken request, and get to the stack trace again. Now if you click on the method call, which is `ray_cfm$cf.call`, FusionReactor will actually be able to show you the file itself! Notice how FusionReactor even highlights the line in the file! FusionReactor contains a huge set of tools, but in this article we focused in specifically on helping diagnose an error in production. In the next one we’ll start expanding our use of FusionReactor and look for more performance related issues. Thanks to our special guest author Raymond Camdem for writing this article for us. FusionReactor 8 (FR8) has been designed to make a developers life easier and dramatically reduce the time required to figure out what’s gone wrong in a production environment. The game-changing “Events Snapshot” capability takes the hard work out of debugging by automatically tracking all latency and thread errors and presenting the developer with insight immediately after the error has occurred. For decades, developers have had to struggle with analyzing log files to figure out why production software is broken – the capability in FusionReactor dramatically revolutionizes this process, by automatically capturing detailed, structured information at the point that errors occur. FR8 will capture variable state across the whole scope of the stack, logged information and even instantly decompiles your code to show you the full context of where and why something is broken. FusionReactor will now automatically capture any information which has been written to logs using one of the standard logging API’s, such as cflog, log4j 2, logback, SLF4J and Apache Commons Logging. FusionReactor is proud and delighted to have been awarded the “Gold Trusted Service Award” for the third consecutive year. Feefo is a reviews and customer insights technology company that provides businesses with the tools to collect real, purchase-verified reviews and insights. To win the award you have to achieve a Feefo service rating of 4.5 for the whole of 2018 – we smashed this with a Feefo score of 4.9. We ensure that all your reviews are read and that your comments are fed back to our developers, support and sales teams. The team at FusionReactor is aware of the changing developer landscape and strive to continually evolve our product with new developer features and support for new technologies. We are looking forward to an exciting 2019. You can read our Customer reviews here. Previously I blogged, in earlier posts, about installing and deploying FusionReactor Cloud to monitor CFML applications on Docker Swarm. The next step is to to configure its updated alerting system to let you know if anything is amiss. FusionReactor Cloud advanced alerting capability allows you to respond quickly to application errors or performance issues by creating metric threshold or status alerts. Cloud features integrated support for many standard alerting tools, such as PagerDuty, Slack, HipChat, VictorOps – as well as supporting alerts via email or web-hook. Alerting is one of the primary three tabs within the FusionReactor Cloud portal, with sub-tabs for Alerts, Checks, and Subscriptions. 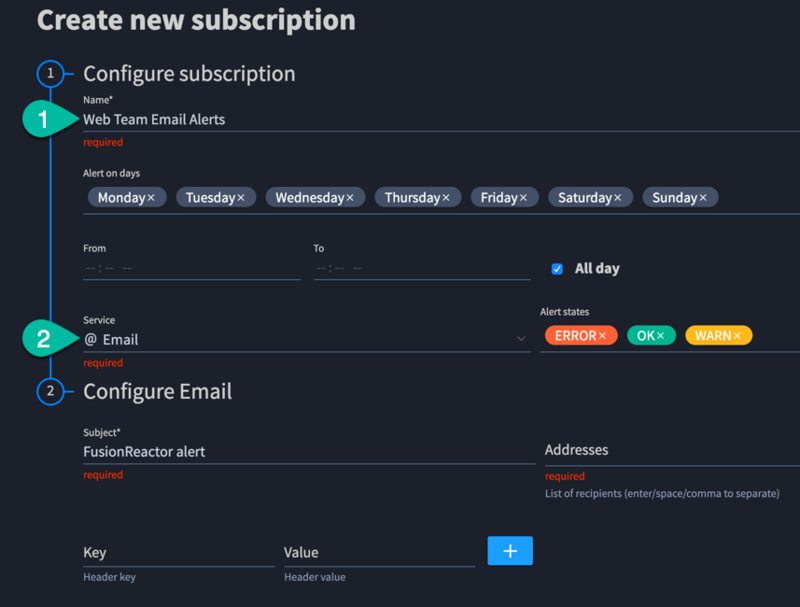 Subscriptions are the who and how of Cloud alerts – that is, who should get alerted and how should they receive the alert? Subscriptions also provide control over when – you can limit them to certain days and/or times. To be of any use, a Subscription must be attached to a Check. Checks refer to the circumstances necessary to trigger an Alert. Broadly speaking, a Check is tied to either the status of a server or a defined set of data points (Memory Usage, Response Time, etc). Subscriptions are attached to these Checks and triggered when the threshold or status is met. These are the why – as in, why should an Alert be sent. Alerts, finally, are the what. Alerts are the consequence of Checks and Subscriptions – when a Check triggers a Subscription, an Alert is sent and logged. As you’ll see, FusionReactor Cloud offers far more granular control than the on-premise edition – this comes at the cost of significantly more configuration necessary to get it up and running. In order to set up a Subscription, you’ll first need to enable one of the many available integrations. An integration is a way of contacting someone; options include Slack, PagerDuty, custom webhooks, and more. We’ll just stick with Email, as it’s the easiest and most obvious choice. Now, I’m of the opinion that the Email integration should be enabled by default, but it’s not. So, once you’re logged into your account, click the Account button in the upper right, and select the Configuration option. Click the Configure button for Email, then all you need to do is choose the Save option… and the Email integration is enabled. On to the actual Subscription setup. Proceed to the Alerting tab and the Subscriptions sub-menu. In the upper right, the +Subscription will open a tab for actually setting up who gets alerts (and when it happens). 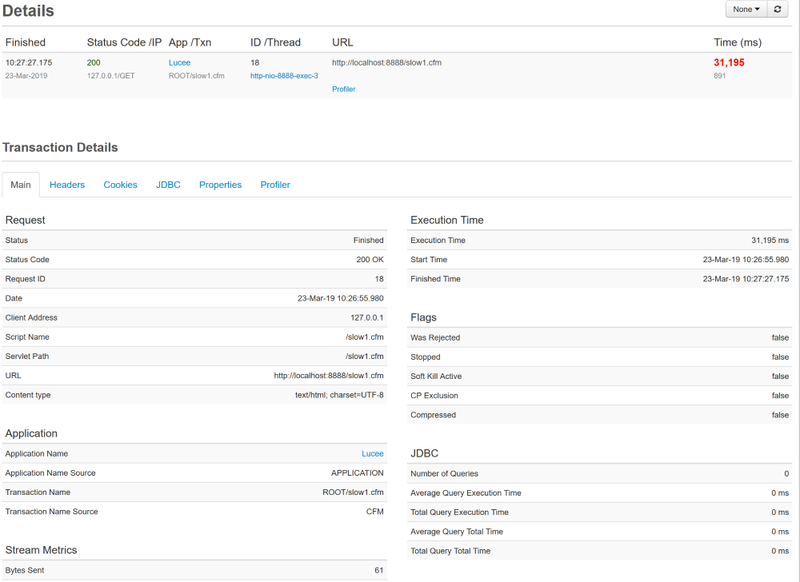 Here, you start to see the level of control that Alerting in FusionReactor Cloud provides. You can restrict this Subscription to certain days of the week, or hours of the day. This may be helpful, for example, if you have a separate team for after-hours. Or, you can have separate Subscriptions for Warning vs. Error states – the latter being set to higher priority, or sent via a different integration. We’re setting up a basic email subscription, so we’ll name it “Web Team Email Alerts”, or something comparable, and choose the Email Service. The default subject provided, “FusionReactor alert”, is fine; in the actual alert email this will be followed by the name of the Check that was triggered. Finally, we’ll add the email address we want to send the alert to, and click “Save”. Your Subscription is now saved; you’ll see its details listed in the main Subscriptions panel, with the ability to duplicate/edit/delete, as well as test it. It hasn’t been linked to any Checks yet, so let’s do that next. In the Alerting section, within the Checks sub-menu, click +Check in the upper right to open the tab for building out a new Check. Within this panel there’s a lot going on. I’ll walk through the options one step at time, but we’ll save actually creating a Check for the next blog post. There are two types of Checks, Threshold and Status. Status checks are the simpler of the two – they are triggered if a server or group of servers goes offline for a period of time.Threshold checks, as explained in the documentation, “are used to alert when a metric value crosses a defined threshold.” Basically, FusionReactor is continually monitoring hundreds of metrics from your servers/applications (CPU Usage, Active Requests, etc.). Threshold checks enable you to select one of these metrics and, based on a percentage or frequency of its occurrence, trigger an Alert. Note that the Name entered here for the Check will be included in Subscription notifications that get sent, so it should be descriptive and clear. Optionally, you can also fill in a Description, for internal reference. The Check is further refined by selecting the type of entity it should be applied to: Server Instance, Group, or Application. Server Instance: Could be a physical server, VM, or a container instance. If you’ve got three container replicas for a Swarm service, each is a server instance. Generally, for Swarm deployments, you won’t be choosing this option.Group: Server instances can be added to one or more groups – this is done on the startup of the server, via Java properties passed to FusionReactor. The FusionReactor module for CommandBox makes these easy to set, via fusionreactor.cloudGroup in server.json. I’ve found Groups very helpful when deploying to Swarm; they make it easy to monitor multiple container replicas as a single entity. Application: The name says it; your applications are listed here. Even if the application is replicated across nodes, you can apply a Check to it. Check timeframe: The Cloud alerting engine runs once every 60 seconds. In order to allow time for ingesting/synchronizing data, the smallest window you can select here is 5 minutes. This is the timeframe within which FusionReactor monitors your error threshold, as well as the period of time it will take for any erroring Checks to return to an OK state. While I’m sure longer timeframes have their uses, I want my error notifications to be as close to realtime as possible, so I’ve exclusively used the “5 minutes” option here. Greater/Less Than: Set the error state as greater or less than the threshold. Data point type: There are four possible options here, three of which are self-explanatory: single, all, and average. I found the count of option to be less intuitive; it brings up an additional option displayed as ( 1/5 ), where you select the first number. The second number, I found out, refers to the timeframe of your check. Because the engine runs every minute, within a 5 minute timeframe there are 5 data points (so longer timeframes increase the second number). Selecting 1/5 would be the same as single, and selecting 5/5 is the same as all – the count of option gives you the ability to choose everything in between. Pick the subscription(s) that this check should trigger. Checks can trigger more than one subscription alert. Finally, a preview graph is provided underneath, illustrating how your Check compares to the metric historically, so that you can see when it would be triggered. After clicking Save to add the Check, you’ll see its details listed in the main Checks panel. As with Subscriptions, from here you can duplicate, edit, or delete it. You can also temporarily disable Checks from this page. Finally, we’ll move on to Alerts; fortunately, there’s nothing we need to configure here. The Alerts panel provides logged reporting of your Checks; any time that a Check changes status, it’s recorded here. Basic logging here includes when Checks are added, paused, or deleted. These changes are recorded, but do not trigger Subscriptions. When a Check moves between the OK, WARNING, and ERROR statuses, the Subscriptions that are triggered will also be recorded here. The “View” option will open a panel with more information about the Alert/Check/Subscription. If you want to see the power of alerting in FusionReactor for docker swarm for yourself you can get a trial of FusionReactor Cloud for free, just create your account and download the software. 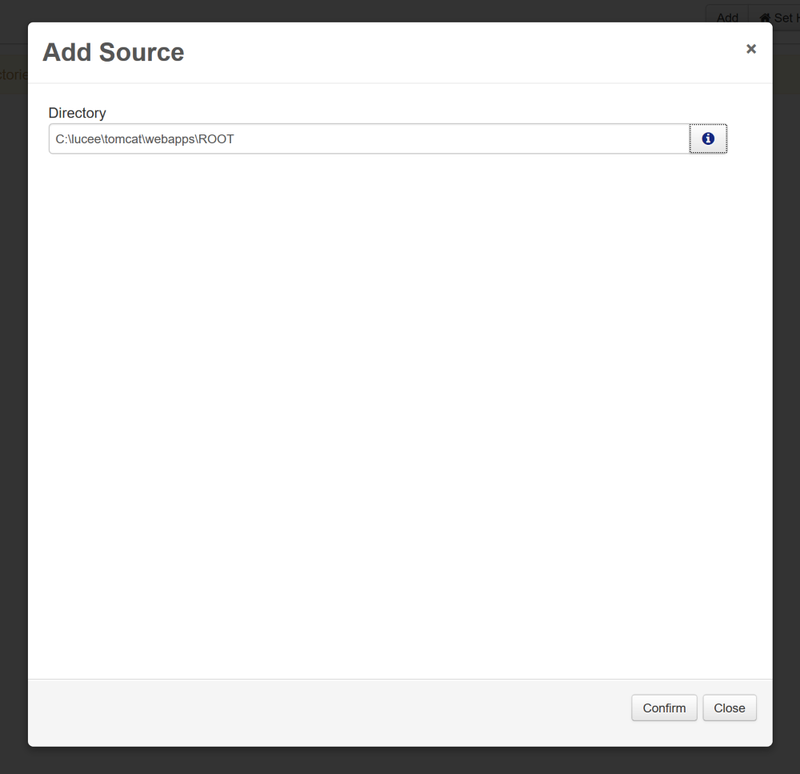 For more information about setting up Alerting in FusionReactor for Docker Swarm contact the FusionReactor Cloud team. 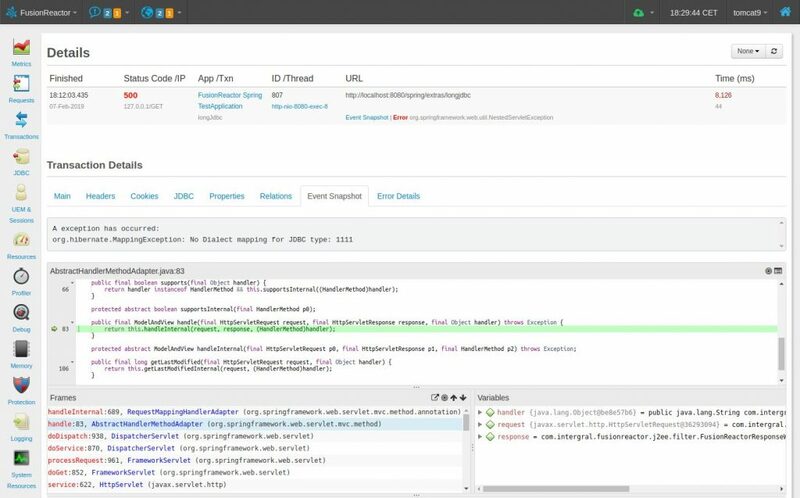 FusionReactor goes beyond traditional Java monitoring capabilities by adding low-level profiling and debugging, giving developers and DevOps the insight needed to identify performance issues and production problems in the shortest possible time. Debugging in production is often considered to be the holy grail of root-cause analysis – just imagine the benefit of being able to introspect variable scope at production runtime! However, the performance degradation and breakpoint impact implications associated with traditional debuggers have rendered them useless in production environments. Intergral GmbH, makers of FusionReactor have developed an extremely low overhead Java debugger (Patent Pending) that can be safely and securely used across the whole Software Development Lifecycle (SDLC), including production. “Debugging a Java application which is running in production is not something most people think of doing. There is typically a performance overhead as well as a number of technical challenges which make this impracticable using existing debugging technologies”, said David Tattersall, CEO of Intergral GmbH, makers of FusionReactor “Intergral have addressed these issues and developed a browser-based Java debugger, which can be used in a production environment and which we believe is a game changer in accelerating the time needed to isolate production problems and performance bottlenecks”. FusionReactor is used by 1000’s of developers and DevOps to cut issue isolation time down from days to minutes. FusionReactor combines the core APM features of metric instrumentation and alerting with low-level profiling and debugging – it is the only product of its kind which is designed for use across the whole Software Development Life Cycle. 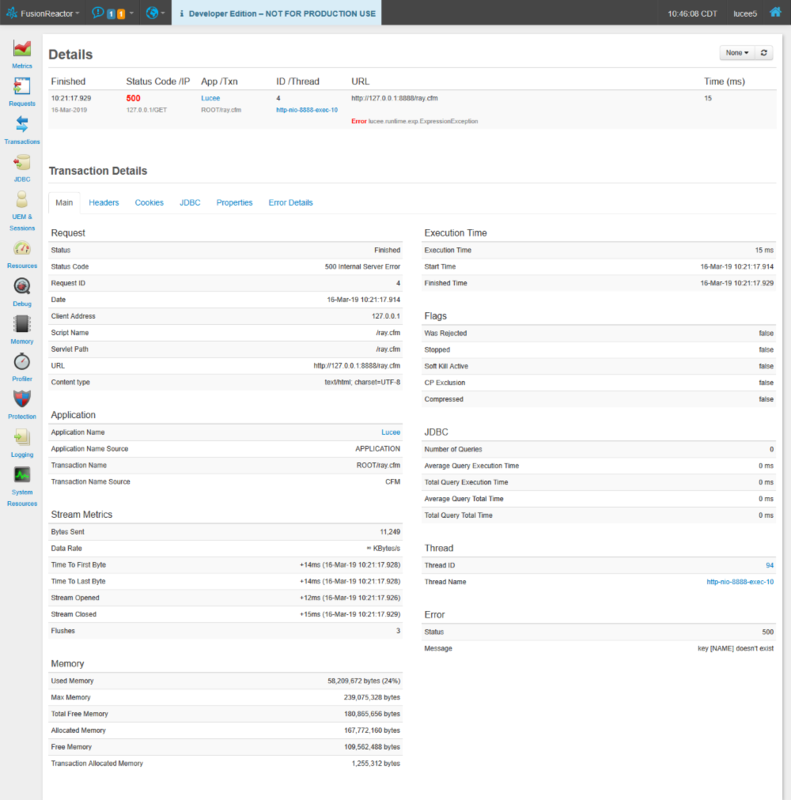 FusionReactor is a hybrid APM solution, available as on-premise and/or SaaS (Cloud-based). Four editions are on offer, Ultimate, Enterprise, Standard and Developer. The Ultimate and Developer Editions include the debugger and low-level profiling tools, Enterprise Edition allows monitoring of multiple instances and servers from a single Dashboard and Standard Edition includes all the core monitoring features. FusionReactor may be purchased as a monthly/annual subscription or as a one-time license. Standard Edition pricing starts at just US$ 39 per month, per server. 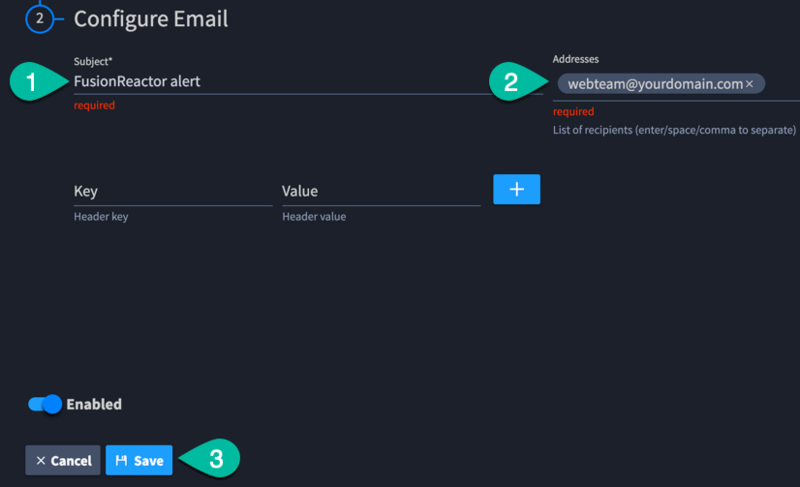 FusionReactor Cloud provides extended data retention, focus on “issue related transactions” and includes advanced alerting capability with seamless integration with tools such as Slack, PageDuty and Twilio etc. Intergral is a leading application intelligence company. Our flagship product, FusionReactor provides real-time visibility and alerting of application performance issues and can be effectively used across the whole Software Development Life Cycle. Thousands of customers trust FusionReactor to monitor their applications, enabling them to identify and respond faster to performance and stability problems. FusionReactor’s aim is to ensure applications run at peak operational and business performance. Learn more at www.Fusion-Reactor.com. This year, the FusionReactor team are once again proud sponsors of the O’Reilly Velocity conference, which is being held in London between 30th October and 2nd November 2018. Under the motto of “Build Systems that Drive Business” – the Velocity conference is an amazing opportunity for Software Engineers and DevOps to build skills to meet the pressing demands of your work, hear from your peers and meet with industry leaders. The conference will deal with aspects such as building secure systems, monitoring / observability / performance and microservices to name a few. Through expert-led presentations (from the likes of The University of Cambridge, Google and Microsoft), you’ll learn to build high-performance, resilient, and secure systems. Register here and use code FusionReactor25 to receive a 25% discount.